Happy Merdeka Day everyone! Today is Malaysia's national day, so it only seemed right to include a post on my blog which is tinged with the flavours of the country. I lived in Malaysia for 5 years and my parents still live there, and although I was a fussy eater while growing up there, I now miss and crave the amazing food there. One of the things that I miss the most is the abundance of pandan flavoured goodies there, including my favourite spread; kaya, made with coconut, eggs and pandan extract. So the other day I decided to whip up a batch of madeleines, these sweet little sponge cakes, which were flavoured with pandan essence that I picked up at the Asian supermarket and I served them with some kaya. Unfortunately I haven't had the time to make my kaya from scratch yet, I swear I will soon though! You can find a lot of pandan flavoured sponge cakes in Asian supermarkets here in Sydney, easily spotted due to their neon green appearance, but good kaya is a little hard to come by. There is one quite common brand called Nonya brand which is sold in a glass jar which my brother swears he has seen them using in Mamak for their roti kaya (I'm not sure how much I believe this), but my favourite one so far is a canned version I found in Cabramatta which is Yeo's brand and is by far the smoothest, eggiest, coconutiest(?!) version I've found off the shelf. I was a little disappointed with the pandan flavouring I bought, it was very weak and watery and not green enough! Definitely getting a much stronger paste version next time. 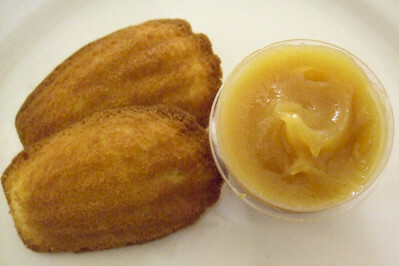 I believe the madeleine recipe is one that my brother found which is very old and works a charm. 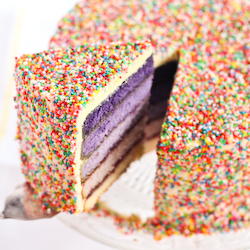 We fell in love with these little sponge cakes after coming across this recipe while having cake cravings and at the time we just threw the batter into a patty cake tin and it still tasted amazing. 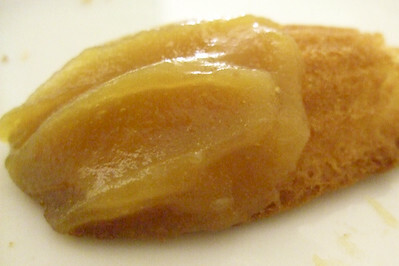 It's by far the most reliable madeleine recipe I've come across, other ones I have tried can be too dry and dense. In fact I'd tried so many bad madeleine recipes that I gave up for a while and my almost new madeleine tin gathered dust at the back of my cupboard until I decided to switch back to this great recipe. I was delighted that this mixture did develop a small bump on the tops, something which I have never managed to get with other recipes. It may have been small but there was definitely a bump! 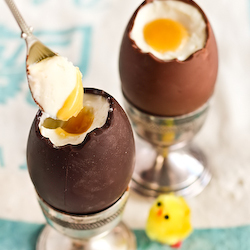 The only thing you have to take care of with this recipe is to not heat up the mixture too much, or you will cook the egg in the batter enough to make the whole mixture taste and smell very eggy. But done right, these madeleines are super light, fluffy and moist with a lovely golden layer on the outside that is fantastic to sink your teeth into. And serving it with kaya enhances the great pandan flavours and had me very pleased with the combination. 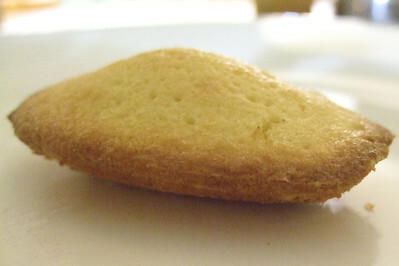 Preheat oven to 180 degrees C. Grease madeleine tin very well, then dust lightly with flour. This will make it easier to remove the madeleines later (I think I can thank Rick Stein for that tip). Add pandan flavouring to taste. Since mine was the weak watery kind, I used almost a tablespoon and it was still quite subtle. If you are using the paste you will need a lot less. 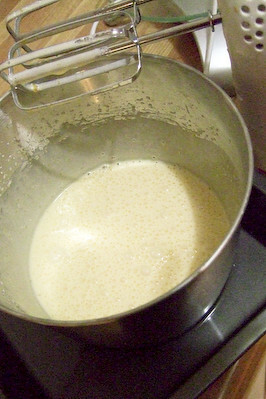 Add sifted flour and carefully fold into mixture. Finally, stir in the melted butter until just combined. 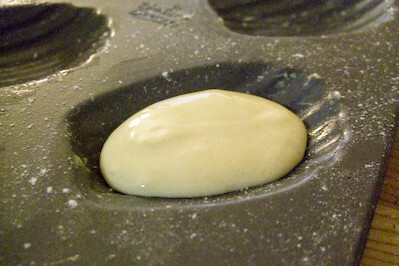 Carefully spoon mixture into the moulds filling them about 3/4 full (a bit less than a tablespoon). 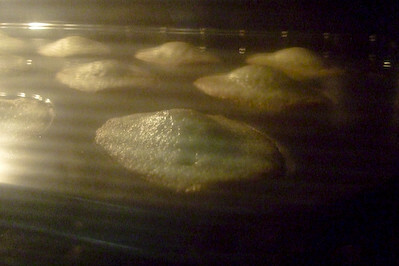 Bake for 10 minutes or until the tops of the cakes are just turning golden. 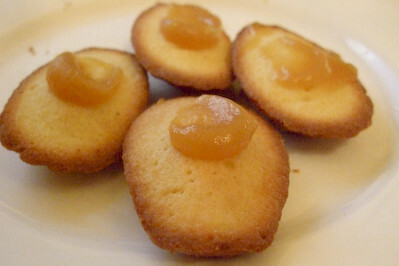 Immediately and carefully remove the madeleines from the tin and cool on a wire rack. Peering into the oven: I see bumps! Can be served on their own dusted lightly with icing sugar or with kaya. I swear I will do a recipe for homemade kaya soon! Best eaten straight out of the oven, but if you really want you can cool them completely and then place in a very airtight container for the next day. The only thing I wish I could have improved was the colour of the madeleines, they really should be much greener from the pandan flavouring, so don't be alarmed if yours turn out greener if you use a better pandan flavouring than I did. The flavour was lovely though, pandan always works well in a light sponge cake (I was originally going to do a typical pandan chiffon cake but didn't have time to find a good recipe since my mum had lost hers :( ), so it was just perfect for the madeleines. I'm not sure why but the heat from the hot water really helps create the perfect texture and flavour in the cakes. 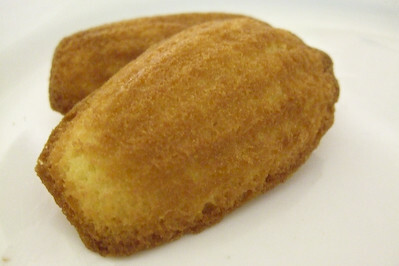 Those madeleines are lovely; I really must get a madeleine pan soon. Great idea to serve them with kaya, too. Ooh, these sound delicious. I'm tempted to buy a tin of that kaya myself! Love the last pic! 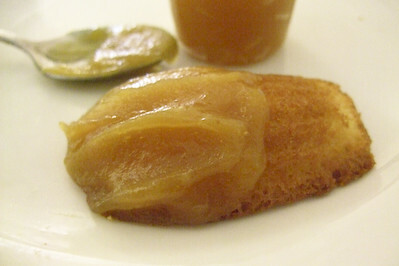 I love the idea of pandan madeleines. yum these look so good! 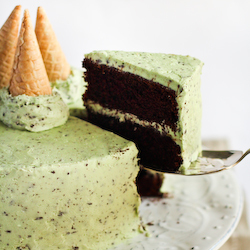 love the idea of fluffy pandan cake and smothering them with kaya sounds even better! Happy Merdeka Day :p I have been anticipating for your pandan madeleines recipe! Love the little hump! I am curious, do they taste like kuih buloh? Haha! Oh.. you can now buy the Yeo's kaya from the asian grocery shop at Mandarin Centre, Chatswood. It's my favourite brand of kaya. oh how yum. 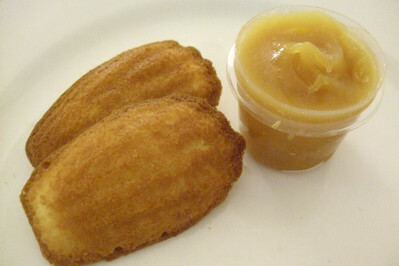 I love madeleines, I like mind dipped in some chocolate sauce. I havent had any pandan flavored stuff for ages. When I was little my mum used to by a pandan flavored cake from the shop all the time. I would always eat it too fast and give myself a tummy ache. It tasted so good though! Happy Merdeka day! The kaya on those cakes looks thick and sweet. I bet good kaya is much better than the stuff you get in the Chinatown bakeries..
Oh yay! You posted it! These tasted sooooo good when you brought us some! I've lost my pandan virginity at Ellie's the other day, and I loved it very much. Oh... Kaya sounds very interesting.. would love to try it. Happy Merdeka Day! What an awesome combination of pandan and kaya! 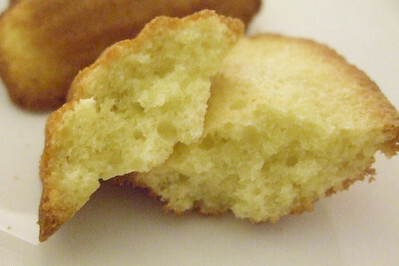 Even though your madeleines didn't look that green, I'm sure it is better for you! Some of the pandan cakes I have seen recently look like a scary shade of green! I prefer the brown coloured kaya than the green one I used to buy before discovering the brown one! happy merdeka day! those madelines look so cute heh love the bump! i've had my madeline tray for awhile now and I still haven't got round to baking a batch - i might do this weekend and make these pandan ones :P I'm a big fan of pandan. hmm..i wonder if the greenness we associate with pandan is just food colouring? Belle - I love my madeleine pan but I don't think I use it often enough to make it worth having it! Helen - Hehe thanks! I know, kaya just makes everything even better! Ellie - Hm now that you mention it, they do taste similar to them! A bit less sponge cake like though and a little crispier on the outside. Omg are you serious?! I've never seen the tinned version there, only the glass jars! Maria - Haha oh yeah I understand the urge to eat it really fast, it's so moreish! Forager - I've never seen the kaya in chinatown but it's definitely hard to find good mass produced kaya. This one I found is the best I've seen in ages! Karen - :D I'm so happy you liked them, I was nervous! Yas - haha your pandan virginity! Glad you liked it, it's one of my fav flavours! Anita - You should try it sometime! Hopefully I'll do a recipe soon. chocolatesuze - Heehee thanks! Happy Merdeka Day to you too! panda - Ooh give them a try, it's a good recipe :) It probably is, the pandan paste seems to have a lot more green colouring in it. I dunno, I've just come to expect it so it was weird not having it! Yummy looking madeleines. I love how you paired this with kaya. Thank you :) Haha I pair a lot of things with kaya, any excuse will do right? It's so damn good! 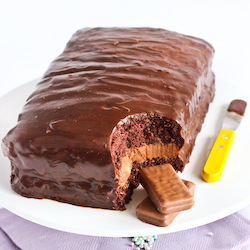 I know its been about 4 years already, but i want to thank you for this recipe! I made some the other day but instead of normal moulds, I used a teddybear mould haha! Also I think I went nuts on the amount of pandan paste.. but they were very tasty! Eee so cute! Nothing wrong with going nuts with the Pandan paste in my opinion, I wish I had the paste rather than the essence when I made this recipe so it had that brilliant green colour that yours have!